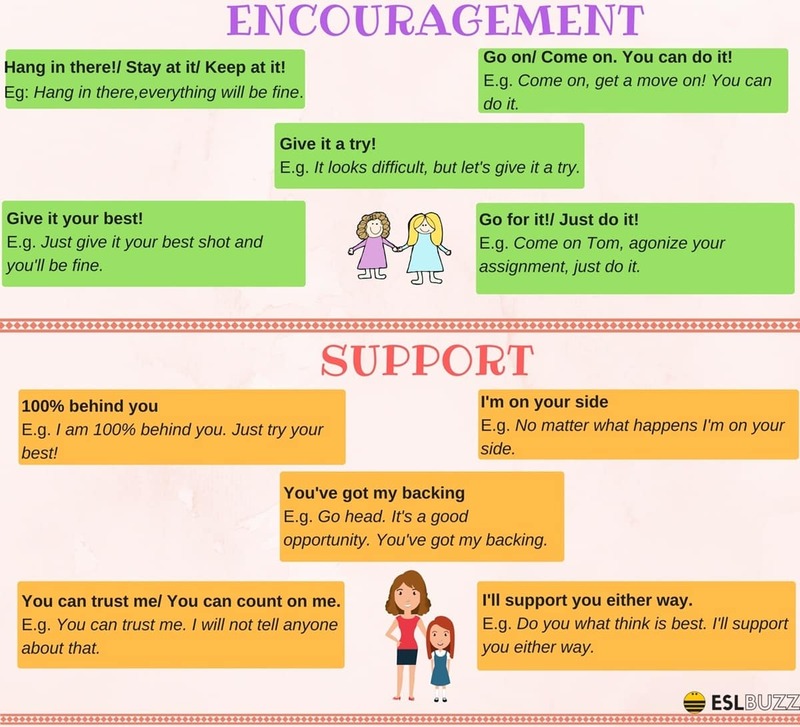 Below is the list of popular phrases for encouraging and supporting someone in English you should learn. Hang in there!/ Stay at it/ Keep at it! Eg: Hang in there,everything will be fine. Go on/ Come on. You can do it! E.g. Come on, get a move on! You can do it! E.g. It looks difficult, but let’s give it a try. E.g. Just give it your best shot and you’ll be fine. Go for it!/ Just do it! E.g. Come on Tom, agonize your assignment, just do it. E.g. I am 100% behind you. Just try your best! E.g. No matter what happens I’m on your side. E.g. Go head. It’s a good opportunity. You’ve got my backing. You can trust me/ You can count on me. E.g. You can trust me. I will not tell anyone about that. E.g. Do you what think is best. I’ll support you either way. – What are you waiting for? – What do you have to lose? – You might as well. – I’m so proud of you! – It’s totally up to you. – Reach for the stars. – The sky is the limit.